Today is Earth Day, which raises awareness about how human actions such as pollution and overdevelopment threaten biodiversity. It presents an opportunity to reflect on the extinction of majestic creatures with whom we once shared the Earth and consider ideas to prevent further species loss. Earth Day 2018 is focused on ending plastic pollution, particularly the single-use plastics that often end up in our oceans and waterways. The plastic threat to wildlife has been driven home by a recent viral video, viewed over 21 million times, of a straw being removed from the nose of a sea turtle. (This video is graphic and contains explicit language.) It’s difficult to watch and not reflect upon the next time you’re slurping a milkshake. But there’s something more proactive that Americans can do to celebrate Earth Day besides refusing a plastic straw the next time they’re ordering at a restaurant or bar. They can support their local zoos and aquariums, which act as modern-day arks of hope for endangered animals across the world. Zoos and aquariums offer a lifeline to animals who have inspired wonder for generations but have little-to-no natural habitat left. These include the most iconic zoo animals—such as big cats, primates, and pandas. Dozens of animals, including the South China tiger, no longer exist in the wild and are only kept in existence because of human care. By saving species, zoos and aquariums also preserve the indescribable connection between people and animals, which has inspired generations of the young and young-at-heart. If this bond is frayed, it will doom endangered species. To generate support for conserving animals, people must first love animals. And to love animals, people must know them. Increasing urbanization means zoos and aquariums are the only opportunity most people get to knowing threatened animals. More than 183 million people—roughly half of the U.S. population—visit a zoo or aquarium annually. Safe in zoos, critically endangered species can work to rebuild their populations, with the help of trained zoologists and breeders. Several species have been saved and reintroduced to the wild through zoo breeding programs. The Arabian oryx, whooping crane, black-footed ferret, and California condor have all seen their populations begin to recover as a result of zoos’ efforts. Washington DC’s National Zoo helped increase the population of the golden lion tamarins from about 200 to 3,200 in the wild today. 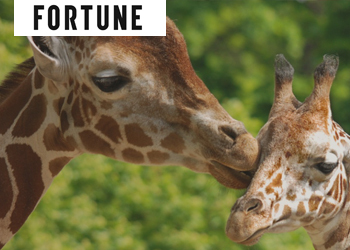 Zoos and aquariums also help finance conservation efforts, spending hundreds of millions of dollars annually on research efforts in breeding, habitat, and veterinary science. The World Association of Zoos and Aquariums has urged zoos to devote at least 3% of their budgets to conservation work. Most zoos have Earth Day programming today to help raise awareness of their inhabitants’ plight. To do the most good, zoos and aquariums must be held to the highest standards of animal welfare. American Humane’s Humane Conservation program furthers this goal by certifying that animals in participating zoos and aquariums are healthy, positively social, active, safe, and living with proper light, sound, air, and heat levels. These standards are set by animal science experts, providing the third-party validation of humane treatment and positive welfare that an increasingly discerning public is demanding. Some of the issues raised by Earth Day seem as vast as the million-square-mile mass of discarded plastics currently floating in the Pacific Ocean. But supporting local zoos and aquariums is a tangible step that has real benefits in protecting endangered species and helping prevent the next white rhino from disappearing from the planet. Robin Ganzert, PhD, is the president and CEO of American Humane.